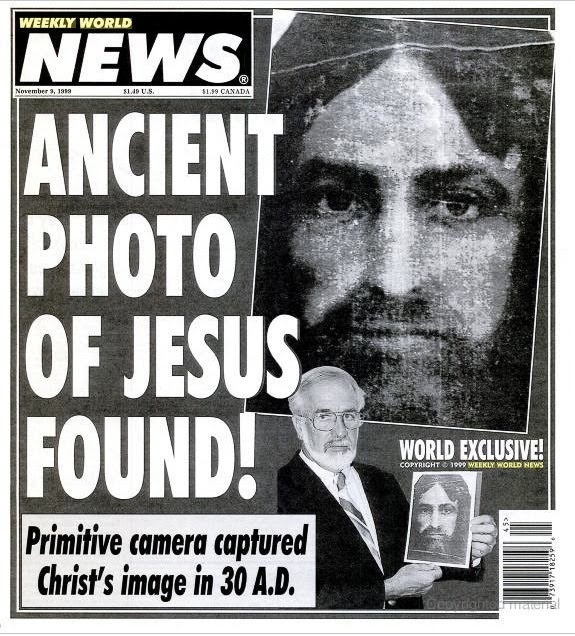 World Exclusive - Funny Ancient Jesus Photo Found News Picture - Weekly World News - Primitive camera captured Christ's image in 30 A.D.
Weekly World News has reported the astonishing find of an ancient photo of Jesus Christ, captured by a primitive camera in Jerusalem, around 30 AD. The black and white photo of a serious, bearded white man was found by Gerry Hatrić of Tiskris, Miss, while touring the Holy Land with his church. "We were astonished," said Mr Hatrić to our reporters. "Of course, people try to sell you all sorts of things in the Holy Land, but we are not idiots. The photo came with a certificate, so was clearly genuine." The photo may be seen in the Tiskris Creationist Museum, along with other rare finds such as Jesus' sandals and a half-eaten apple from the Garden of Eden.